When traveling in France, you can't help but marvel at the towering Gothic cathedrals that mark the centers of many towns. I like to imagine what it was like to be a pilgrim 600 years ago, wonderstruck by saints and Bible stories, and hiking for days and even weeks to a particular church on a particular holy day -- until there it appeared...on the horizon...the towering spire of the cathedral marking your destination. While I never choose a hotel room just for the views, occasionally I open the window and am blessed with a lovely surprise. 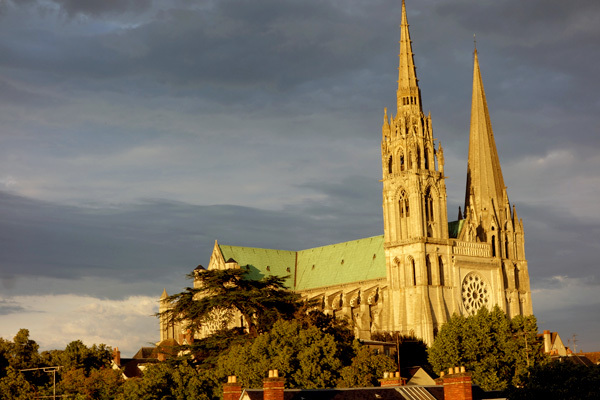 Here in Chartres, after a thunderstorm cleaned out the mucky air, the setting sun invigorated the cathedral with warmth. I positioned my chair for the view, put my stocking feet on the windowsill, and enjoyed one of those "European moments." Do you know what I mean? Great cathedrals were draped in great art. Back in the Middle Ages, the noble art form was architecture, which was done for the glory of God. Sculpture, tapestry, and stained glass were also considered worthwhile, as they decorated the house of God. That's why the finest art of the 13th and 14th centuries (called "The Age of Faith") was art that decorated the churches. Of course, the acidic air of our age has threatened the survival of these statues, and these days most great cathedrals have replaced their medieval decorations with modern versions -- and adjacent museums show off the fine original art from the church safely out of the elements. 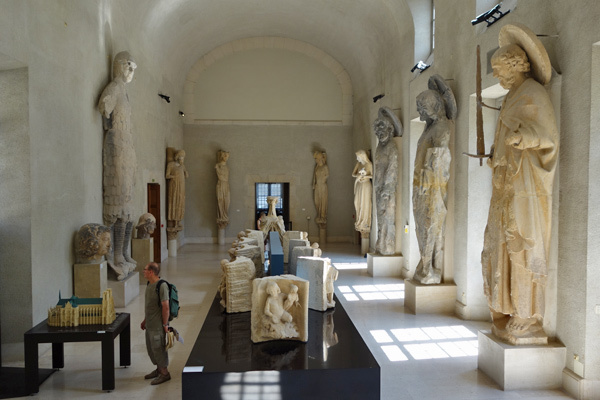 Here in the Reims Cathedral Museum (Palais du Tau), I enjoy a chance to see 700-year-old statues and lovingly assembled and stained windows up closer than their creators ever imagined the public would see them. Gothic cathedrals had wooden roofs (which were prone to fire) with lead surfaces. For decades, I've heard guides describe the horror of a Gothic roof burning and "molten rivers of lead cascading down." I've long wondered if that was an exaggeration. 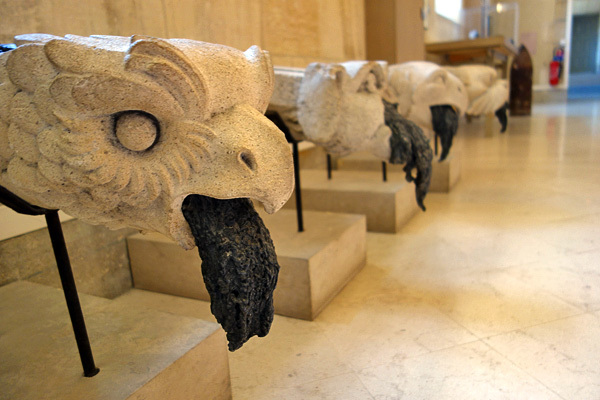 Then, at the Reims Cathedral Museum, I saw gargoyles (which are designed to function as storm drains and spew rainwater away from the walls during thunderstorms) with those "molten rivers of lead" right there...caught in their stony throats. Wow. That made my afternoon. I love France, and always cut the French a little slack for their national pride, which can be misinterpreted by American visitors. But lately, I'm a little disappointed in their lack of English information posted at sights of international interest, where over half the paying public probably doesn't speak French. I was just at the Museum of the Surrender in Reims (the headquarters from where Eisenhower ran the final months of WWII, and where the Germans finally signed the surrender treaty on VE Day) and found exhibits in French only. I got a little heated with the staff there, who didn't seem to think it mattered. (I believe proper translations could be created and posted in about one day's work, and in the two years since I last visited and complained, nothing has been done.) 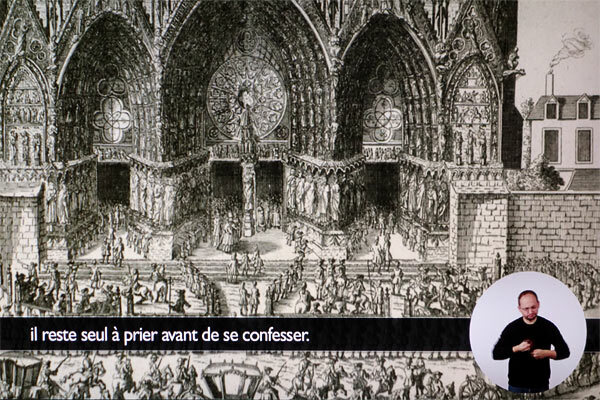 This photo is from a different sight, the Reims Cathedral Museum (Palais du Tau), where the informational videos (which I'm sure were fascinating to French speakers) had a French soundtrack, with French subtitles, and signed in French to boot. Each day, I imagine a thousand paying tourists who don't speak a lick of French visit here and get nothing out of the video. And each day, maybe one deaf person is thankful for the sign language. My favorite way to appreciate a great Gothic cathedral is with a good local guide. I like an art historian who understands the mindset of the medieval faithful and knows how to take me there. 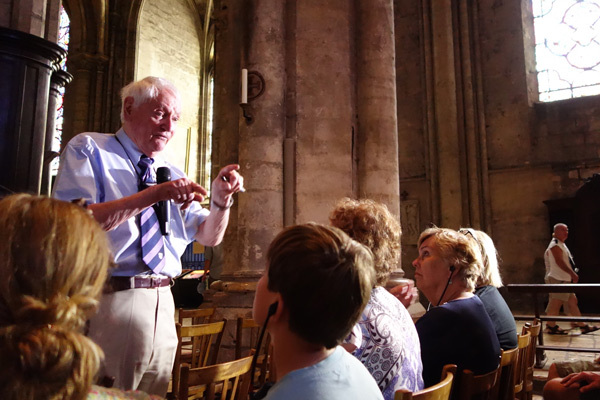 For about 50 years, the English scholar Malcolm Miller has been guiding small groups on intimate tours of the statues and windows of Chartres Cathedral. I've been enjoying his talks with each visit since the 1970s. I was so thrilled to hang a mic on Malcolm and include a bit of his lecture as part of our TV show. Every cathedral needs a Malcolm Miller...but only Chartres has one. Thank you, Monsieur Miller, for a lifetime of inspiration.